[27 October 2015] The arrest of the three peaceful protestors during the Chinese President’s State Visit last week was raised in parliament yesterday via an Urgent Question submitted by Fabian Hamilton MP. The Minister responsible for policing, Mike Penning, refused to comment on the matter citing that it was “an ongoing police investigation”, but then came under increasing pressure as MPs lined up to criticise the decision to arrest the protestors. 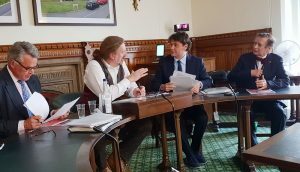 Tibet Society, as Secretariat for the All Party Parliamentary Group for Tibet, worked with Fabian Hamilton MP to raise the Urgent Question and provided a synopsis of the protests and arrests to MPs. The arrests of three peaceful protestors during the Chinese President’s State Visit to the UK are a very serious breach of the rights of British citizens to legitimately protest. The actions of the police raise questions as to where the orders for the arrests and home raids emanated. The circumstances leading to the arrests must be investigated and any collusion with Chinese security made public. The UK police must not be allowed to become a puppet of the Chinese State. 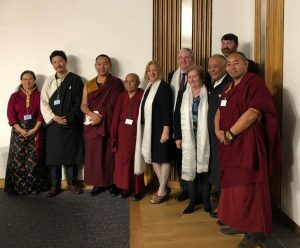 Fabian Hamilton (Leeds North East) (Lab) raised the issue of the arrest of Tibet protestors during the Chinese President’s State Visit as an Urgent Question following parliamentary regular business on 26 October 2015. The Minister for Policing, Crime and Criminal Justice, Mike Penning, responded on behalf of the government. The issue, including subsequent comments and questions by MPs, was discussed for almost 30 minutes before the Speaker brought the matter to a close. Mr Penning refused to answer, saying it was “not a matter for the Police Minister to comment on”. MPs from all sides of the House then lined up to support the protestors and to question the Minister further. To these questions Mr Penning continued to reply that he could not comment on an ongoing investigation. During which time he appeared to be getting redder and redder in the face. Matthew Pennycook (Greenwich and Woolwich) (Lab) & Emily Thornberry (Islington South and Finsbury) (Lab) both raised concerns on behalf of their constituents, Sonam Choden and Dr Shao Jiang respectively. Ms Thornberry said the decision to arrest her constituent was “disgraceful”. Andy Slaughter (Hammersmith) (Lab) called on the Minister to “properly investigate” the circumstances leading to the arrests. Further comments were made by Mark Pritchard (The Wrekin) (Con), Ms Gisela Stuart (Birmingham, Edgbaston) (Lab), Mr Dennis Skinner (Bolsover) (Lab), Mr Barry Sheerman (Huddersfield) (Lab/Co-op), Mike Gapes (Ilford South) (Lab/Co-op), and Mrs Madeleine Moon (Bridgend) (Lab)..
On 21 October, two Tibetans and a Chinese human rights defender were arrested for peacefully protesting during the Chinese President’s State Visit to the UK. Whilst in custody, their homes were raided by the police and computer equipment confiscated. The three individuals had done nothing more than engage in their legitimate right to peaceful protest, which is a basic right upheld in British law. It is clear from responses to the arrests that many members of the public are also deeply concerned about the government appearing to bend over backwards to provide a platform for the leader of the Chinese Communist Party at the cost of the public’s rights and privacy. The three, Dr Shao Jiang (above), Sonam Choden (right) and Jamphel Lhamo (below), were arrested in two separate incidents. They were initially arrested to ‘prevent a breach of the peace’ under Section 5 of the Public Order Act. Later, when at the Bishopsgate Police Station, all three were arrested on ‘suspicion of conspiracy to commit threatening behaviour’. The police used undue force when arresting Dr Shao Jiang who, whilst standing on his own in the road with two A4 sized placards calling for human rights for the people of China, was tackled to the ground by more than five police officers. Footage of his arrest was very clearly filmed and has been shown on the BBC, Channel 4 and other media outlets. A little later, Sonam Choden and Jamphel Lhamo, were arrested for attempting to wave a Tibetan flag at the passing cavalcade of cars. Two days earlier, during the procession on The Mall to welcome Xi Jinping, many human rights protesters were completely swamped by thousands of Chinese students who surrounded, harassed and intimidated anyone who raised a placard or Tibetan flag. The police stood by and did nothing to protect the protesters from such threatening behaviour. This was evident from a letter published in The Independent from Carole Beavis from Derbyshire. Carole, who had come to London to support groups campaigning for Tibet and human rights in China, spoke of her shock at, “the scale and level of organisation of the Chinese “welcome” that accompanied the President’s every move”. 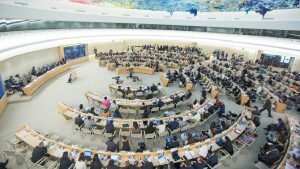 This eyewitness account about the lack of response to protect legitimate peaceful protesters from orchestrated intimidation only adds to the concerns over the validity of the arrests of Dr Shao Jiang, Sonam Choden and Jamphel Lhamo, and raises serious questions over the even-handedness of the police approach. Dr Shao Jiang, Sonam Choden and Jamphel Lhamo have been arrested under Section 5 of the Public Order Act. There is no inference of any potential violent act being prevented. Had this been the case they would have been arrested under Section 4 of the Public Order Act (unlawful violence). To raid people’s homes, seize their computers and other electronic equipment for alleged breach of the peace, is unwarranted and borders on a violation of privacy. To send eight police officers to one home, five to another and use keys taken from one of those arrested to enter his home is disproportionate. Moreover, it is a very questionable use of police time and resources. 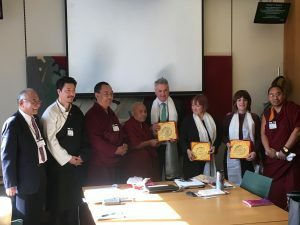 Lobby your MP to join the Parliamentary group on Tibet!